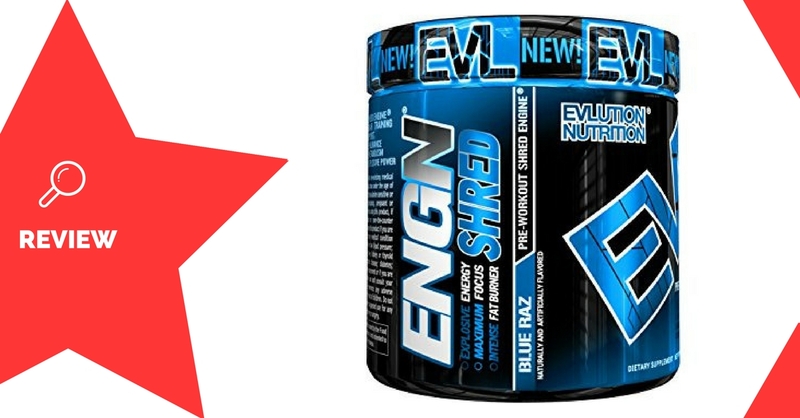 ENGN Shred is a pre-workout and fat-burner made by EVLution Nutrition. 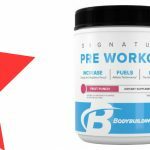 It’s a special version of the original ENGN formula, which is designed to both improve workout quality and fat-loss. EVLution Nutrition is an award-winning supplement brand, which was founded in 2013. Betaine is a compound that is found to occur naturally in sugar beets. The research is promising, showing that it may improve both power output and lean body mass (1). An effective dose is around 2.5g. Choline is a brain-boosting vitamin, which has been shown to improve cognitive performance in humans (2). ENGN Shred contains two forms of the compound, bitartrate and alpha-GPC. Bitarterate is a cheaper form which may not be entirely effective, but alpha-GPC has shown good bioavailablity and effects on cognition and even power output (3). Tyrosine is an amino acid which reduces stress hormone levels. This can improve performance under stress or fatigue (4). An effective dose is about 500-2,000mg. Agmatine is a compound that increases nitric-oxide levels. This can have a “vasodilation” effect – a widening of the blood vessels, which improves blood flow, pumps, and even endurance (5). It may also be able to reduce stress and improve mood. 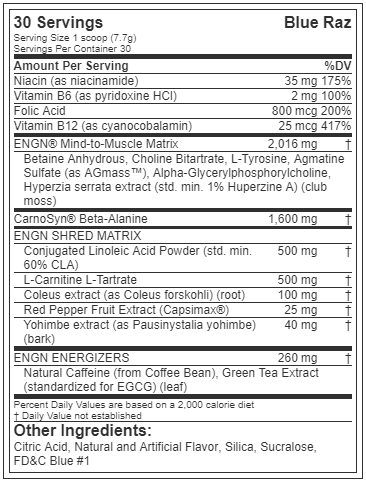 Huperzine-A works synergistically with choline to improve acetylcholine levels in the brain. This can improve focus and memory (6). The effective dose is 50-200 micrograms. Beta alanine is a beta-amino acid which delays fatigue. 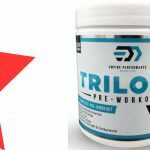 It does this by increasing levels of carnosine in the body, which counteract the build-up of acid and free-radicals during exercise (7). Caffeine, as we know, is a stimulant that improves alertness and energy levels. At higher doses, it’s also known to improve athletic performance (8). An effective dose can range between 200-500mg. Conjugated linoleic acid (CLA) – is a type of fatty acid which may increase fat oxidation (9). Carnitine is an amino acid that aids with the metabolism of fat. This form of carnitine, however, can also boost power output (10). An effective dose is 1-4g. Coleus forskohlii is a herb that may reduce body fat, increase lean body mass, and even boost testosterone levels (11). The bark of the yohimbe tree contains potent fat-burning compounds which have been shown to reduce body fat levels even in well-trained athletes (12). It may be accompanied by strong side effects, such as anxiety and elevated heart rate. It may also interfere with other medications. Green tea contains green tea catechins, which have been shown to improve fat oxidation significantly when paired with exercise (13). The effective dose is 400-500mg of extract. Red pepper contains a compound called capsaicin, which may improve metabolic rate and fat oxidation (14). Athletes wanting to improve their workout quality and fat-loss may enjoy using ENGN Shred. 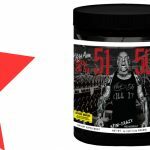 Mix 1 scoop (7.7g) with 250mL water, and consume 30 minutes before working out. Beta alanine is known to cause a harmless tingling sensation in the face and skin. Yohimbe may trigger anxiety and interfere with other medications. May upset the stomach if taken with insufficient food or water. ENGN Shred is a 2-in-1 formula, which is designed to boost workout quality as well as fat-loss at the same time. 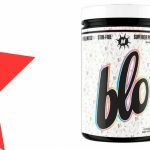 They combine well-researched ingredients into what would be a great formula, had they been dosed correctly. 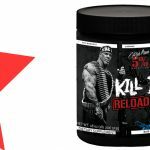 Unfortunately, virtually none of the ingredients are present in clinically effective doses, meaning you may have to double-scoop to get any appreciable effects out of ENGN Shred.